I thought I'd post a bit earlier this week as, perhaps, you might enjoy this activity during your Labor Day family BBQ's. Nothing could be easier and more fun than making Monster Bubbles in the backyard! 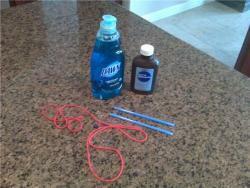 Your simple supply list includes: two plastic drinking straws, one 2 ft. long piece of string (this can be modified by cutting it shorter to fit a tiny hand), one bottle of glycerine (I bought mine at CVS, as you can see), liquid dish detergent (Dawn works the best, in my opinion), a rubber bucket or dish pan, and water. To begin, let's make the most-perfect-yet-super-simple bubble wand to enhance the thrilling Monster Bubble making experience. Simply thread the string through the straws. Knot the ends of the string together and squeeze that knot inside one of the straws. Trust me. This works. Use the outdoor water hose or a pitcher of water to s-l-o-w-l-y fill the bucket 3/4 full. Let the stream drizzle out the nozzle or you're going to have to wade through a mound of bubbles to get to that burger waiting for you on the grill! Gently swish your hand in the solution to blend the Dawn, glycerine, and water together. The solution should feel wonderfully slimy! Well, that's it for this week. Have a simply delightful Labor Day holiday! If you make Monster Bubbles, I know that you'll be squeaky clean all day long.